A new father has told how he and his partner spent Christmas Day keeping vigil at their baby daughter's bedside after she contracted swine flu. 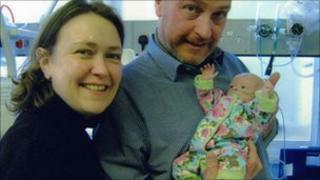 Richard Allott and partner Lesley Hatton, from Aberystwyth, feared the worst for two-month-old Millie. But after several days in intensive care in Singleton Hospital, Swansea, she is recovering well. Millie was born two months prematurely on 21 October in West Wales General Hospital in Carmarthen. She was being treated in the special care unit and had already fought off pneumonia when she caught the H1N1 virus. On Christmas Eve her mother and father received the call every parent dreads and were told to rush to be with her, as doctors feared the worst. Mr Allott told BBC Radio Wales: "We got a phone call from the hospital on 21 December to say she was being put on a ventilator because she was struggling to breathe. "Then they told us she might have swine flu and she was transferred to Singleton the next day. "The next call we were told she was struggling and might not make it so we had to travel down to Swansea to be with her. "It was not a nice call to take and not a nice drive." The pair sat with Millie on Christmas Eve and Christmas Day, as she was treated with swine flu drug Tamiflu. Their Christmas lunch consisted of instant soup and crisps, but they hardly noticed. Mr Allott said: "Being by her bedside was the most important thing in the world. "The care and attention she received was great. The staff at both hospitals have been fantastic - we couldn't have asked for better. "By the afternoon of Christmas Day she had turned a corner and by Boxing Day, she was starting to get better." Millie is now back in the special care baby unit at Carmarthen where nurses are helping her to gain weight before she can go home. Her father added: "She is a strong, feisty baby. "Next Christmas will be very special - she will know about it!"